From the Davy Crockett backup story in the British Marvelman #231, here is some 55-year-old Jack Kirby artwork you may not have seen before. Very interesting. Simple designs are sometimes the best. I like these drawings by Bloop and you can see many more of them over here. I like the way the above shows the evolution from Steve Ditko pencils to inked version to full color version, and I thought you might enjoy it also. The drawing is the cover to a new book, and details are available over here. Chip Kidd designed the Jurassic Park logo. He has written books about Batman and Captain Marvel. He has written novels. And now he has written Go: A Kidd's about Graphic Design. I will be getting that book. A short interview with Chip Kidd appeared last week in The New York Times, and you can read that article over here. Intrigued and ready for more? Here is a long-form video of Mr. Kidd interviewing Milton Glaser, the designer of the beloved DC Comics bullet. And here is a video, taped just last month, in which the gentleman tells that he is obsessed with Batman. A quaint enough 1953 cover by Rocke Mastroserio, right? But modern-day artisan Jason Willis has transformed it into a thing of wonder. Mr. Willis has animated the cover into 33 seconds of incredible fun, as you can see for yourself over here. Hopefully more of these beauties will be forthcoming! I was just watching Prime Minister's Questions on c-span and guess who I saw? That's right! Simon Kirby. The gentleman is a Member of Parliament representing Brighton, Kemptown, and Peacehaven. 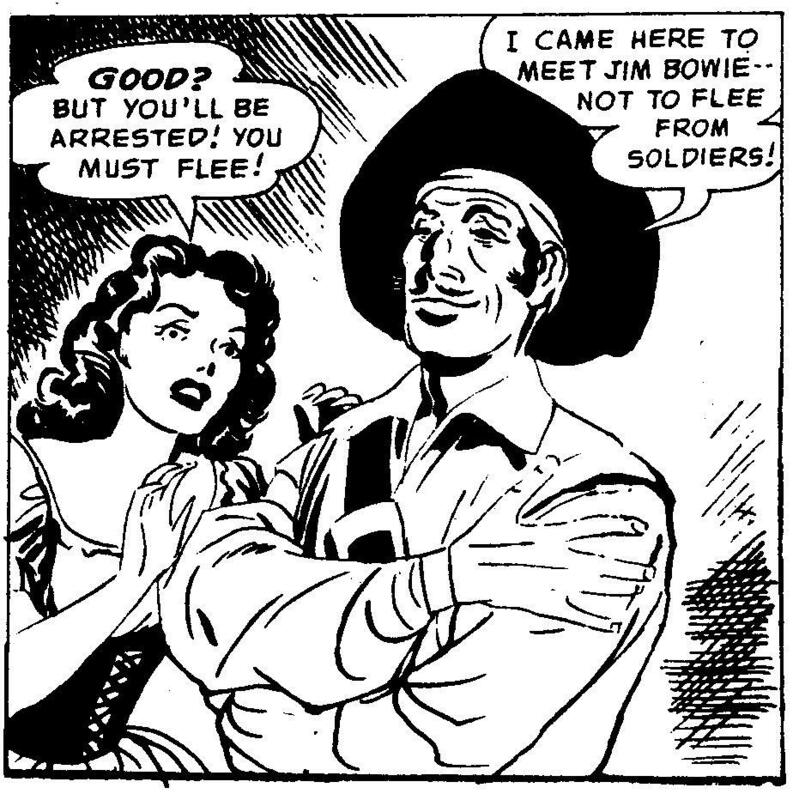 I suppose it's possible his parents named him in honor of Joe Simon and Jack Kirby but chances are that they probably did not. @hayfamzone Perhaps I should be Blue Bolt? Calvin and Hobbes is my favorite newspaper comic strip of all time, and Mental Floss magazine has snagged a new short interview with usually-silent cartoonist Bill Watterson. You can read it over here. 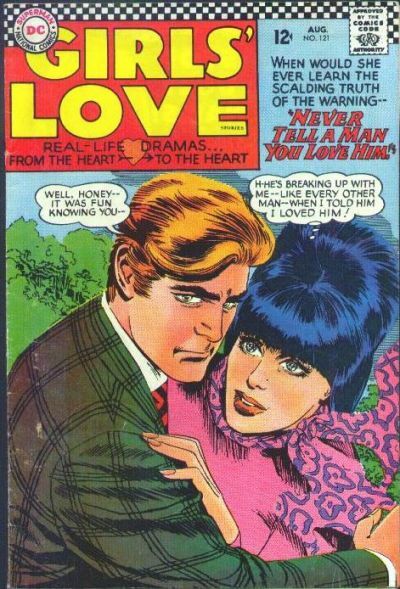 How in the world was Tony Abruzzo able to draw Zooey Deschanel for the above 1966 DC Comics cover when she wasn't even born until 1980? Bravo, chap! 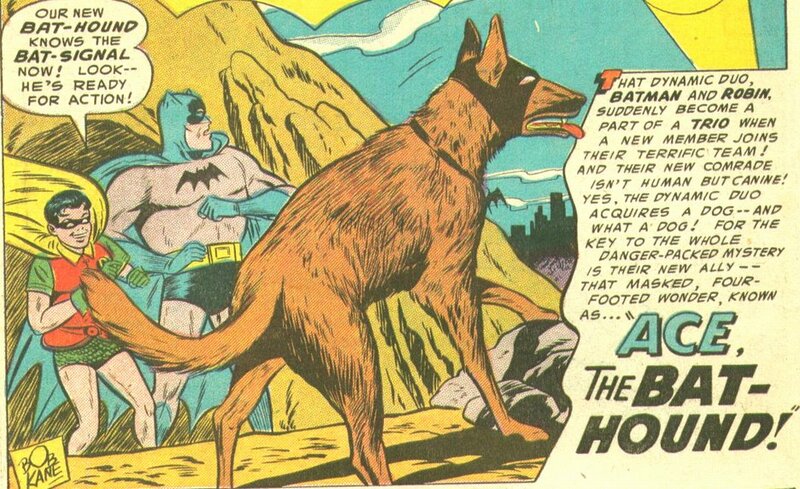 Ace the Bat Hound entered the Batman mythos in 1955's Batman #92. 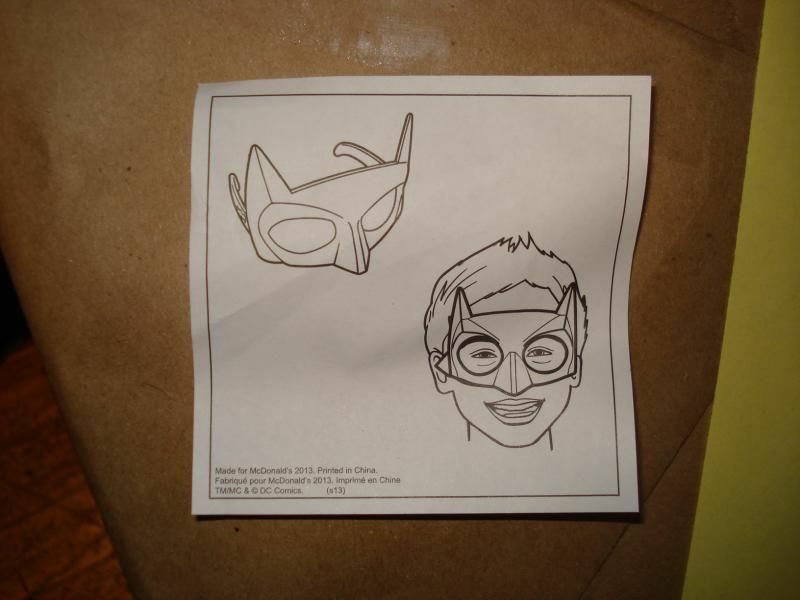 And now, thanks to the Batman mask currently available in McDonald's Happy Meals, I have a Bat Hound of my very own. It is my distinct pleasure to introduce Big Boy the Bat Hound to the world. That's him down here and I apologize for the blur in the photo but he was (as usual) rushing off to fight some crime. Round them all up, Big Boy! 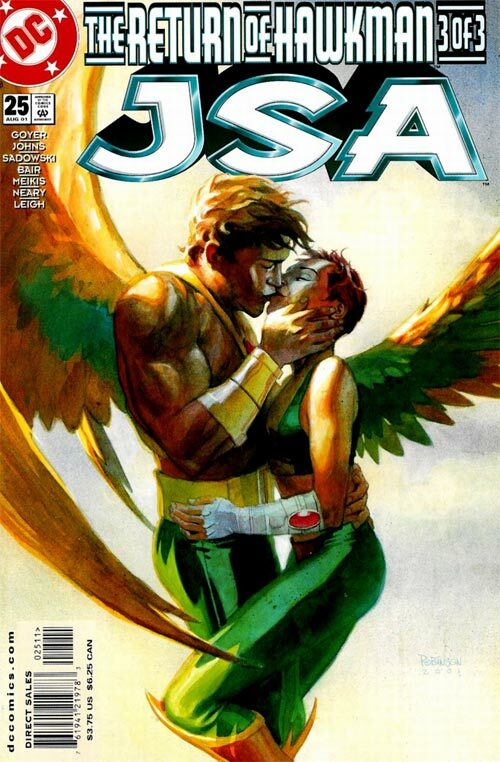 A mystery individual who goes by userLDB has posted a compilation of covers centering around kisses, like the JSA sample above. I would say all of his exhibits are from 1993 or later but many of them had slipped my mind and it was nice to see them again. My favorite among his presentations is the Garcia Lopez Deadman masterpiece; you can view it and all the many more right over here. This is the greatest comic book news I've heard all year! DC Comics has heretofore demurred from collaborating with IDW Publishing on any of their Artist's Editions, but it was announced today that there will be a volume of Jack Kirby's New Gods! I own original artwork from Jimmy Olsen and The Forever People and Mister Miracle but The New Gods is the one Fourth World series I don't own any page from. But now it will be as if I own the artwork to five complete issues of the title! IDW shoots from the original artwork and prints at full-size and their previous collections have been beautiful. I own three of their earlier ones and back here I told you how wonderful the Joe Kubert Tarzan edition is. And now, the best is yet to come. Like the DC house ad in 1970 told us, KIRBY IS COMING! Say, have you paged through your copy of FanInformer #34 lately? Probably not. I might hazard a guess that not many copies of this 1973 fanzine exist anymore (if there were ever many printed to begin with). I sold my copy on ebay last week and I want to take this opportunity, for the sake of historical posterity, to show you a couple of interesting things in that issue. The drawing above is by Tom Orzechowski. That's right! Before he gained fame as the letterer of The X-Men and other Marvel comics Mr. O dabbled in a bit of drawing. Who knew? And the page shown below was drawn by Keith Pollard, a year before he turned pro and just a handful of years before he would draw The Fantastic Four and Thor and Spider-Man. Honestly, where in the world but the hayfamzone are you going to see tasty nuggets like these? The hayfamzone is the place to be! Over here is an archive of articles about Jack Kirby that have been published on the Hooded Utilitarian website. Let's just call it SHIELD because I am not typing all those periods! I was going to skip the new SHIELD television show because I just didn't care about it. Then I decided to watch it and wasn't expecting much. But guess what? I liked it! A lot! I was worried that the debut's excellence was due to Joss Whedon's intimate involvement with that episode, but I've now seen the second installment (with its fewer Whedon fingerprints) and that one was just as wonderful! I noticed that one tweeter bemoaned that the show can't be taken seriously as SHIELD if there's no Nick Fury in sight, but Samuel L. Jackson himself did make an appearance at the end of the second show. And did you hear the one character state to another that they would be taking a Journey into Mystery? I saw in the credits that Jeph Loeb was listed as one of the executive producers (as was, surprisingly, Joe Quesada). I really liked the credit line that said the show was "Based on the Comics Stories of Stan Lee and Jack Kirby." 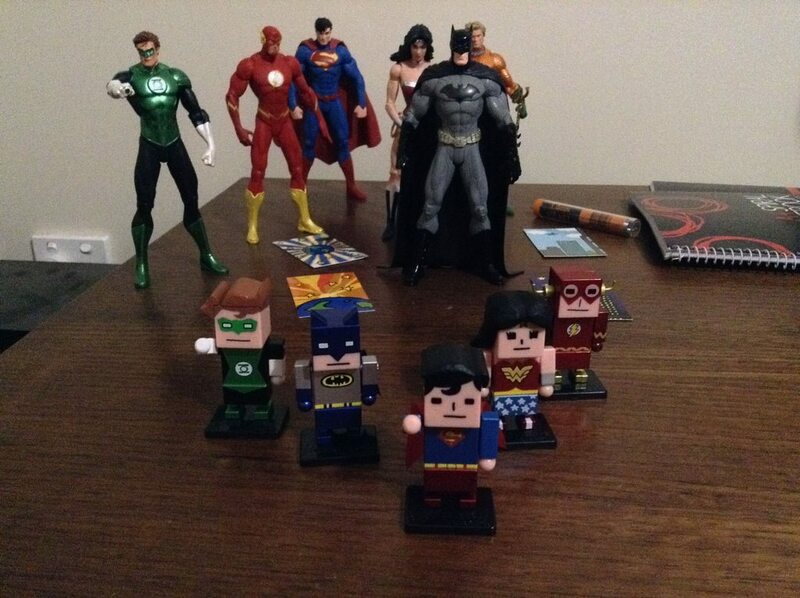 In case you need one more thing to collect, maybe you'll be interested in these Justice League miniatures from Japan. 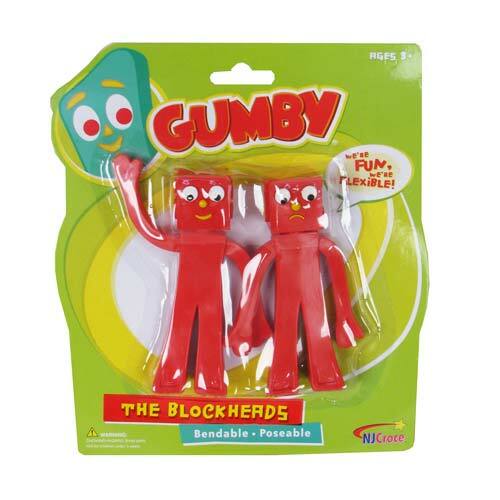 The figures themselves are (intentionally?) 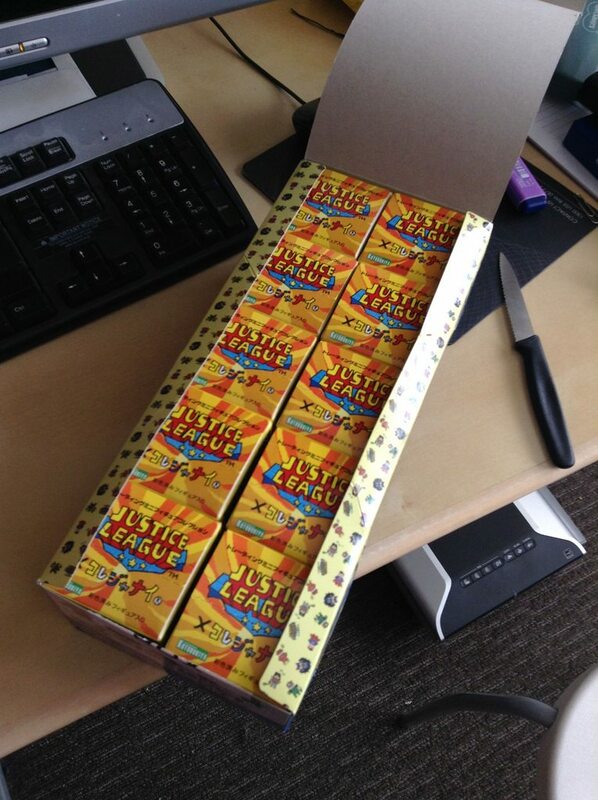 grotesque but I find the packaging they come in to be fairly intriguing. You can see many more photos over here. Now that The Legion of Super-Heroes has been written out of DC Comics continuity (or has it? ), we should probably take every available opportunity to at least think about the Legion. Here is a little article about some nice Legion artwork by Ty Templeton. A nineteen minute live action movie featuring The Question? You know that The Question was created in the 1960s by Steve Ditko but appeared in only a handful of stories at that time. Denny O'Neil and Denys Cowan picked up the gauntlet two decades later and featured the character in his own monthly series for four years. Vic Sage may be getting a new berth soon in DC's New 52 but, while we're waiting for that, maybe you'd like to take a peek at the film that I stumbled across. I won't even get into whether I think the movie is good or bad; it's just great that somebody believes in the character so much as to put all this effort into their project. You can watch the movie over here. You may want to lighten things up for yourself a bit after the movie, and here is a cartoon appearance of The Question that might be just what the doctor ordered. Do you remember Spidey Super Stories from back in the 1970s? 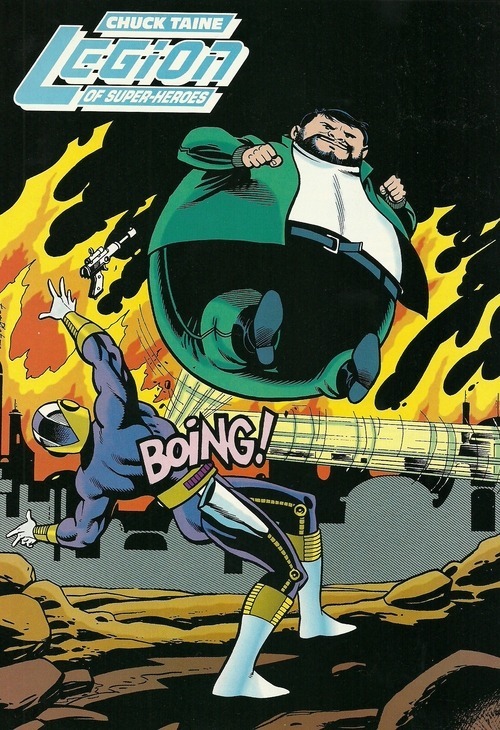 There was some great Win Mortimer artwork in those comics. 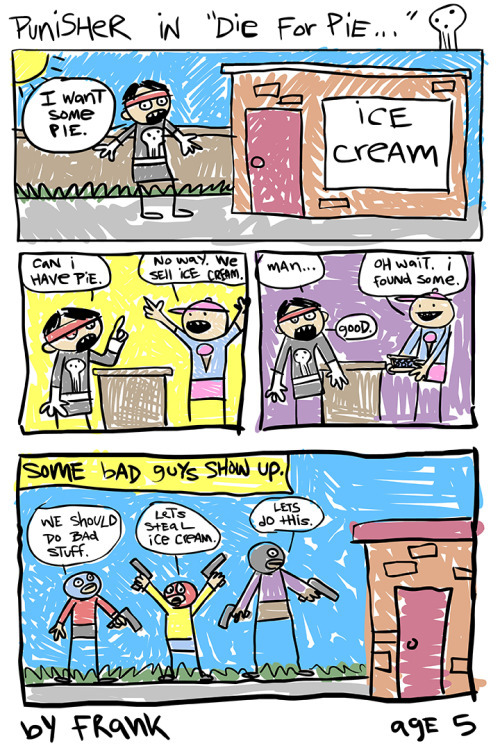 Well, now an artist named Brendan Tobin has had the fun idea to write and draw a story of The Punisher as if by a five-year-old. It's very fun and I especially like the crayon-like way Mr. Tobin splashed on the color. You can read the entire strip over here. Enjoy!